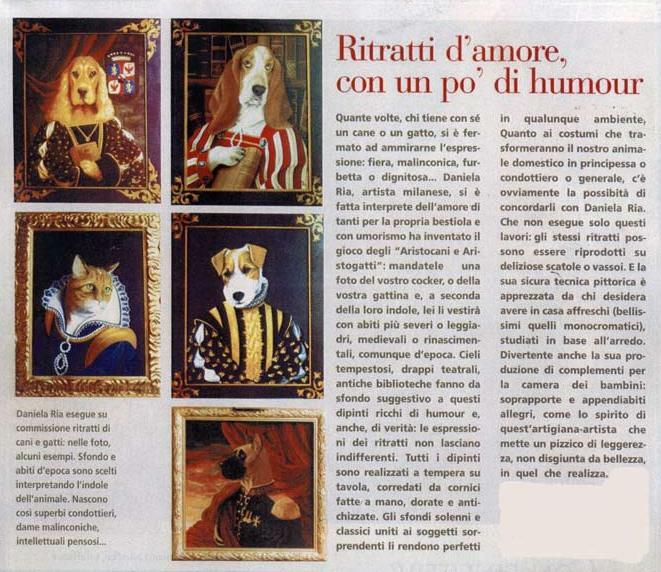 How many times, whoever holds a dog or cat, has stopped to admire the expression: fair, melancholy, curious or dignified … Daniela Ria, a Milanese artist, has interpreted the love of many for her own animal and With humor has invented the game of “Aristocani and Aristogatti”: send them a photo of your cocker or your kitten and, depending on their indole, you will dress them with more stern or fairy, medieval or Renaissance, however vintage. Stormy skies, drapery drapes, ancient libraries are an inspirational background to these humorous paintings and, indeed, the truth: the portrayal expressions do not leave you indifferent. All the paintings are made of tempera on the table, complete with handmade, golden and antique prints. Solemn and classic wallpapers combined with surprising subjects make them perfect in any environment. As for the costumes that will turn our pet into princesses or a leader or general, there is obviously the possibility of agreeing with Daniela Ria. That does not just perform these jobs: the same portraits can be played on delicious boxes or trays. And his sure pictorial technique is appreciated by those who want to have frescoes in the house (beautiful monochromatic ones), studied according to furnishings. It is also fun for her to produce complementary children’s suits: overclothes and coat hangers, such as the spirit of this craftsman-artist who puts a touch of lightness, not unmoved by beauty in what he does.